Revenue in the Hot Drinks market amounts to US$15,972m in 2019. The market is expected to grow annually by 2.2% (CAGR 2019-2023). The market's largest segment is the segment Coffee with a market volume of US$11,796m in 2019. In global comparison, most revenue is generated in China (US$43,567m in 2019). In relation to total population figures, per person revenues of US$48.53 are generated in 2019. The Hot Drinks market includes Roasted Coffee, Instant Coffee, Tea and Cocoa. These are products that are designed to be consumed with hot water or other liquids. Brand names in this category include Nescafé, Lipton and Twining of London. The market for Hot Drinks is structured into off-trade sales (in stores) and on-trade sales (in coffee shops etc.). Statista values off-trade sales at retail prices (including sales taxes or VAT) and on-trade sales at wholesale prices (excluding sales taxes or VAT). Additional markups for hospitality services are therefore not taken into account. All prices include consumption taxes (like the coffee tax) that are imposed in some countries like Germany. Reading Support Revenue in the Hot Drinks market amounts to US$15,972m in 2019. Reading Support The Hot Drinks market is expected to show a revenue growth of 2.5% in 2020. Reading Support The average revenue per person in the market for Hot Drinks amounts to US$48.53 in 2019. Reading Support 2.6% of off-trade consumer spending on food, drink and tobacco products will be attributable to online retail by 2023. Reading Support In the market for Hot Drinks, volume is expected to amount to 1,665.0 mkg by 2023. 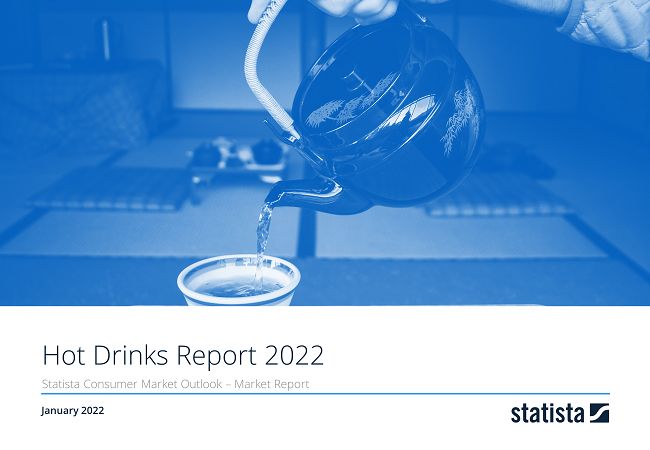 Reading Support The market for Hot Drinks is expected to show a volume growth of 2.6% in 2020. Reading Support The average volume per person in the market for Hot Drinks amounts to 4.7 kg in 2019. Reading Support The average price per unit in the market for Hot Drinks amounts to US$10.41 in 2019. Reading Support With a market volume of US$43,567m in 2019, most revenue is generated in China. Here you can find more studies and statistics about "Hot Drinks".